Streamline your sales processes and get seamless Microsoft Office 365 integration with Microsoft Dynamics 365 for Sales Professional. Streamline sales workflows with a sales force automation (SFA) solution that works with tools you already use, like Office 365 and LinkedIn. Enable sales teams to easily collaborate across functions with Dynamics 365 customer information and file sharing directly from Microsoft Teams1. Work on the go with rich and seamless mobile applications, and close deals faster using real-time collaboration with colleagues and customers. Strengthen customer relationships with interactions tailored to their needs, based on contextual guidance and a consolidated view of customer activities. Visualize the customer’s organization and get clarity on the relationships among contacts using interactive org charts. Get greater visibility into your sales performance with informative dashboards and reports. Get up and running in hours with an intuitive, guided experience for set up and Office 365 integration. Easily adapt the application for your specific sales process, and when you're ready to expand, this flexible and secure platform grows with your business. Use prebuilt solutions from Microsoft and our partners to extend the capabilities of Dynamics 365 for Sales Professional when you have unique business process or industry needs. Get started quickly, understand business scenarios, and get product updates. Forrester positions Microsoft as a leader in their Forrester Wave: Sales Force Automation Solutions, Q2 2017. 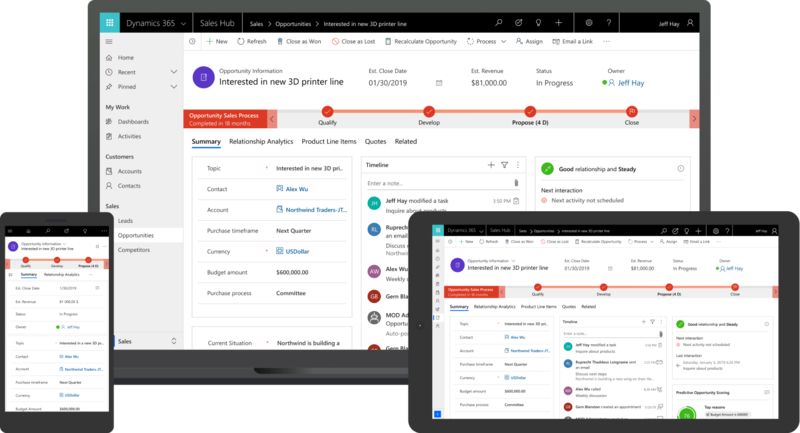 Streamline seller workflows and increase productivity with sales capabilities embedded in Office 365.